Jupiter, Fla., Nov. 10, 2013 – After 15 years, and four extra innings, the Georgia Cherokees had what they had always wanted – a Fall Classic championship trophy. Ted Pratt, on a 3-0 pitch with two outs in the inning, singled home Eric Suttle in the top of the 13th inning to give Georgia the lead, and Dan Crumpadded two more with a double in the Cherokees’ 6-3 victory over the Dallas Barons in the 18 Wood Bat championship game. In a see-saw battle the Cherokees simply outlasted the Barons – and they had Crump and Pratt to thank most. The duo went the distance – 13 innings — on the mound, holding a high-powered Dallas offense to only three runs and escaping major damage through nearly every inning. Pratt went the first eight innings yielding just two runs in the fifth and another in the seventh. For Crump, the ride was much more emotional. Knowing he was a run away from losing each time he took the mound, Crump escaped several jams, none more difficult than the bottom of the ninth. Crump was masterful allowing just three hits over the final five innings. For Peters, there was no doubt who would get the ball at the end. “Crump was terrific,” the manager said. “He’s one of our main guys, so we know it’s good to have him in the clutch. Georgia also had multiple opportunities to plate the winning run, but each time came agonizingly short. In the eighth, the Cherokees left the bases loaded, and in the 10th they left runners at first and second without scoring. The game appeared headed to the 14th when Georgia put together an unlikely game-winning rally. With two outs and the bases empty, Suttle got his third hit of the night — a bloop single to left off Niedzwiecki, who had relieved starter David McLanahan in the eighth. Vince Palmer lined a single between short and third to move Suttle to second. Then, on a 3-0 pitch, Pratt lined a single to left that scored Suttle with the go-ahead run. 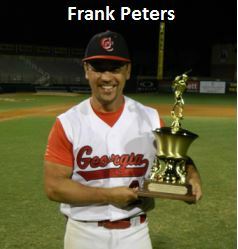 Peters said he did not give Pratt the green light to swing 3-0 in the 13th inning, but Pratt confidently added, “no one ever didn’t give me the green light… I was just looking for something fat and slow,” said Pratt, who was also part of the 2012 Georgia Barons team that claimed the Fall Classic MABL Wood Bat title. “[Niedzwiecki] was struggling to throw strikes,” Pratt continued. “I knew it was through as soon as I hit it.” Crump’s double to right-center provided a pair of insurance runs that he said he’d never needed. Crump got the final three outs, but not before adding to the drama by hitting a batter and allowing a single with two outs. Finally, a line out to second gave the Cherokees their long-awaited title. For Dallas manager Dave DePaul, the difficult loss didn’t overshadow a dominant week. Georgia reached the title game after going 2-2 in round robin play and defeating last year’s title game participants – Georgia Barons (12-8) and Miami Marlins (13-3). Dallas had a 3-1 round robin record and beat Venezuela(4-1) and the Tampa Bay Bombers (4-3) in the playoffs.